You can also specify advanced table properties during the creation time (avg. row length, checksum, etc.) For this, click on the Advanced Properties tab. This again depends on MySQL versions used as explained above. 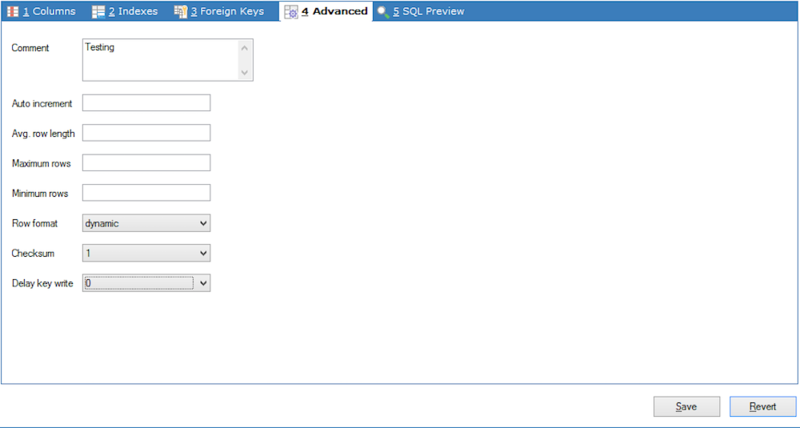 If you want to see the CREATE TABLE SQL-statement in advance that SQLyog will send to the server click the SQL Preview tab. If the data entered is incorrect, you can revert the changes by clicking the Revert button else click on Save to create the table.